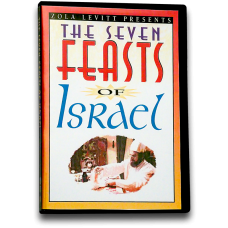 (7 programs on 2 DVDs) In video form, with footage from Israel, the feasts are seen in light of their ultimate glory. A wonderful experience! The Messiah, clearly presented in this 3,500-year-old crown jewel of the biblical festivals. “In Adam all die… in Christ shall all be made alive” (1 Cor. 15:22). The true and elegant origin and meaning of Easter. The real festival of the Harvest, fifteen centuries old when the Holy Spirit came. An uplifting look at a great miracle. The Rapture in its original form. The liberating Festival of Trumpets heartened God’s people through the ages. An awesome day of confession and repentance still faithfully celebrated in the Jewish community today. A vital symbol of salvation. Thanksgiving, Old Testament style! Believers will celebrate this grand festival in Jerusalem for a thousand years to come! The delightful festivals of joy when Israel rejoices in the blessings of the Lord. The incredible noisemakers set Purim apart from any other religious rite.